What can you learn from a day intensive on canopy instruction? A freakin ton. Should it be mandatory? You betcha! I learned more than my mind could capture over a 12 hour seminar given by Scott Miller and his [Freedom of Flight](http://freedomofflight.tv/public/index.php?which=canopy) Essentials Canopy course. 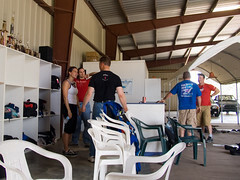 Robin and I packed up and went down to [Skydive Carolina](http://www.skydivecarolina.com) on Thursday to save waking up at a horrible hour to make it to my class on Friday at 8:30a. We worked a little on the cabin, grabbed some local chow, and hit the sheets early. Friday came quick and I was ready as ever. We met with Scott where he informed us that our Cessna was being taken to Clemson and we were going to have to wait for Eric, our pilot, to get back to fly the Twin Otter. Not a big deal. We crammed more of the classroom work in and then got started around 1:30p. I was also lucky enough to have some great people get me a demo of my upcoming parachute the [Performance Designs](http://www.performancedesigns.com/) Sabre2 230 so my lessons would have direct translation. [Scott](http://freedomofflight.tv/public/index.php?which=aboutUs) created this course because of the absence of the training in the industry. Before the 90’s canopy related fatalities were about 1 a year. In the mid-90’s it rose above 10. The reason, performance canopies were in, experts were jumping them and novices wanted to play too. This brought a lot more people into the landing pattern a lot sooner than it used to be and with more people there are more accidents. Scott is working with the [USPA](http://www.uspa.org/) to find a way of improving their AFF course to include these materials in an effort to make our DZ‘s a safer place. The class is normally broken into an hour of lecture, a jump to work on skill building, then back to the classroom for video review/critique and another lecture. Seeing yourself on video–which shows everything–even things you don’t realize you’re doing, is so very helpful. Then getting wise instruction on how to repair what you’re doing for the next jump is just an enormous aid. 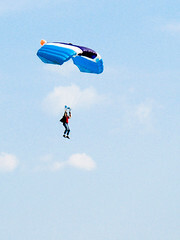 The [essentials course](http://freedomofflight.tv/public/index.php?which=canopy) is the first of two courses for canopies. Our class was broken into the understanding of perfecting the flare and finish, accuracy/precision landings, flat turns, stalls, and handling cross country–long flights. Anything that was to be done near the earth was done repeatedly from 5,000-2,000ft above ground. Doing so builds great confidence and kinesthetic understanding for when you’ll need to react properly in diverse sometimes dangerous situations. We worked our tails off. After a light variable wind day pushed us down wind for nearly all our landings I think we performed pretty well. If I were to say what three things I enjoyed most it would have been learning the timing of the flare and the idea of a finish to improve landings, the details for planning my jump run more effectively, and my first cross country from 2.5 miles off the DZ sitting on my toggles in 75% brake. We stayed over night again since I was given the opportunity to continue flying the demo canopy. Over the course of the day I put in three more jumps and Robin recorded them. I stitched it all together for a [youtube](http://www.youtube.com/watch?v=426qRU-3aD0) video. If you want to learn how your canopy really operates and some hard hitting methods to gain even greater control visit Scott in DeLand or keep on the look out for his course coming to a DZ near you. It is practical and should be a requirement for all of us. This sport is a risk, but a calculated one, the more we know the lower that risk ratio gets and the more fun we can all have.